John is writing to his own community about what it means to be true disciples of God and Jesus. The quoted verse is in a section of the letter that concerns love for our brother or sister. John has a powerful verse that reads, “Whoever does not love remains in death.” (v 14) We know love because Jesus showed loved, through His death. Therefore we should be willing to do the same. 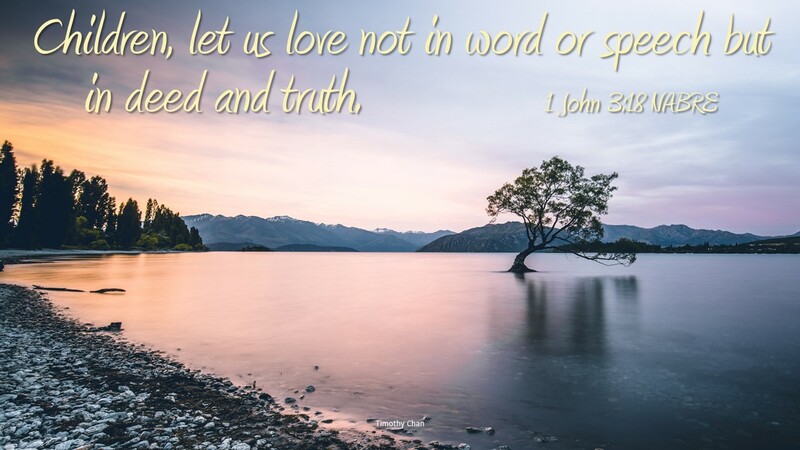 John asks us to love like Jesus, we should not love in word or speech, but in deed and truth. To love in word means simply to talk about a need, or pray for a need. To love in speech is loving insincerely, doing nothing more than providing platitudes and nice words. We are to love in deed, which means to do something about meeting a need, it calls for sacrificial service. To love in truth is to love genuinely, from the heart. People were attracted to Jesus, even people who were nothing like Jesus liked Jesus, most likely because he loved in deed and truth, he was sincere, genuine and people knew his love was real. We are called to love by doing, by sacrificing, it is a love that could cost us a great deal. It cost Jesus a great deal to love, His entire life was for others. We are not our own, we are called to live for others, and in so doing we love in deed and truth. Unless we show love through our actions, we are not truly followers of Jesus. If our entire being is not about truth, in other words followers of Jesus who follow Jesus total self-giving, we are not truthful followers of Jesus. This may sound uncomfortable, or too difficult, but this defines a follower of Jesus. We cannot love Jesus and put our self first, we must put others first, serving their needs. Then we are followers. Do you love in deed and truth? Have you ever felt love by words alone?